Design your promotion in mere minutes with our easy to use, feature filled promotion campaign design tool. 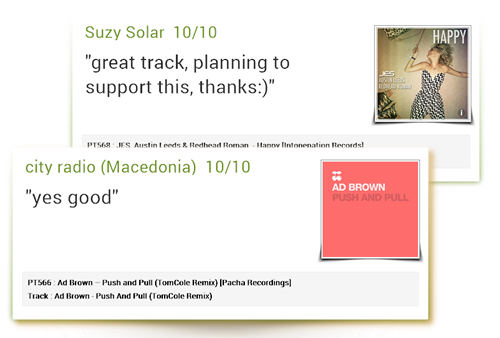 Prevent tracks being downloaded with feedback lock, apply the rules on an individual or complete promo level. You are in full control of the sample quality, choose from 96kbps to 256kbps. Want more control? You can also choose the sample duration. If selected a zip file od all tracks will be available as a download to your receivers along side individual files. We were offering schedule send outs long before anyone else, Specify who gets your promotion and when they get it. Your promotions are as individual as you are, no two promotions ever need look the same with our theme designer. Simply choose your theme when designing your promotion. Industry leading comprehensive but easy to understand music promotion statistics that are available in real time. Drill down into individual sections and analyse your data further. 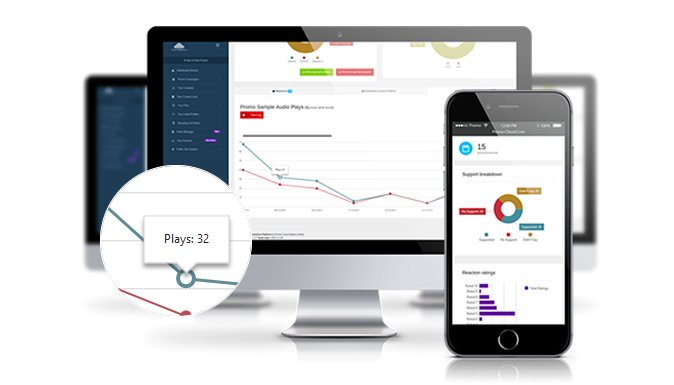 Powerful, comprehensive and fast analytics. Export to PDF and scheduled weekly reports. Contact management is breeze. 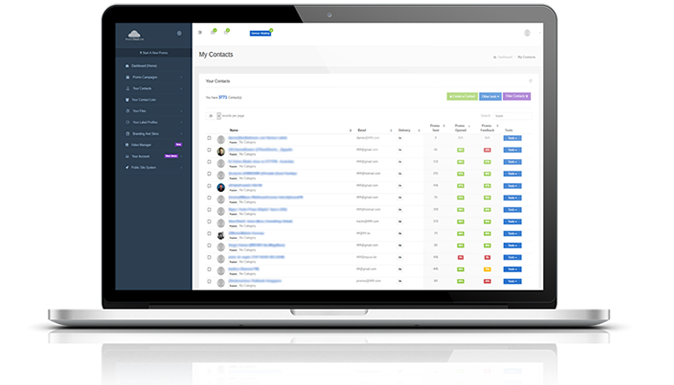 A beautiful interface and intuitive tool set will save you huge amounts of time administering your contact base. Importing and exporting of contacts. 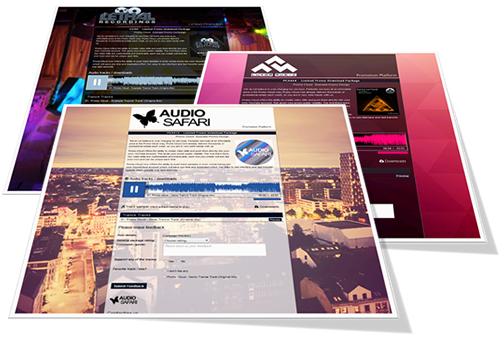 You only need to provide a WAV or MP3 source file, our system will automatically embed all the relevant track names, genres and artwork into the high quality final downloadable promo files in both MP3 and WAV formats. 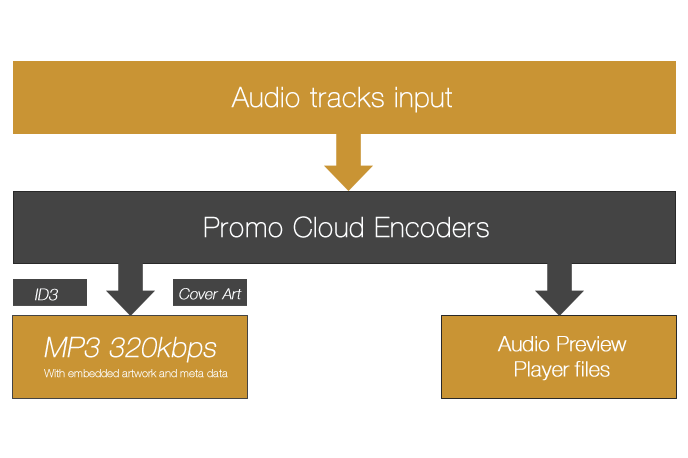 Our encode engine will also automatically create your sample preview auto files to your own length and quality specification in both MP3 and AAC formats which allows for a much larger native playback experience for your receivers. Create a unique look for every single promotion that you send. Included free of charge with your Promo Cloud account is the ability to create and manage promo themes. 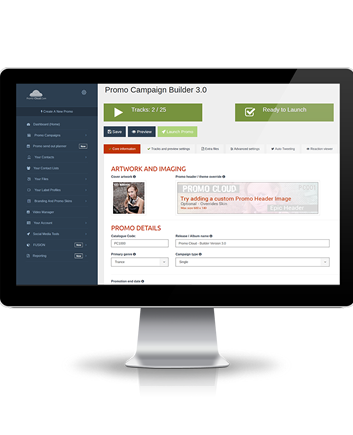 Our fantastic, easy to use theme builder tool will have your promotion looking as good as you do in no time at all. Promo Cloud can automatically tweet using your Twitter account positive support. Adding a contact and artist twitter information makes the feature even more powerful by tagging in relevent partys. Our Facebook badge generator allows you to share support on facebook backed up by a beautiful, shareable support image badge.